My kids and I may be afraid of the dark, but we held our breath and turned out all the lights this week for some glowing science magic! Now to clarify we did keep one light on, a black light, and gathered up some glowing liquids to make a mesmerizing Magic Potion Density Tower. NOTE: You must have a Black Light for this to work. The glowing liquids are UV light reactive. I highly recommend this black light because it’s durable and powerful. An incandescent black light bulb isn’t powerful enough to get a good glow. 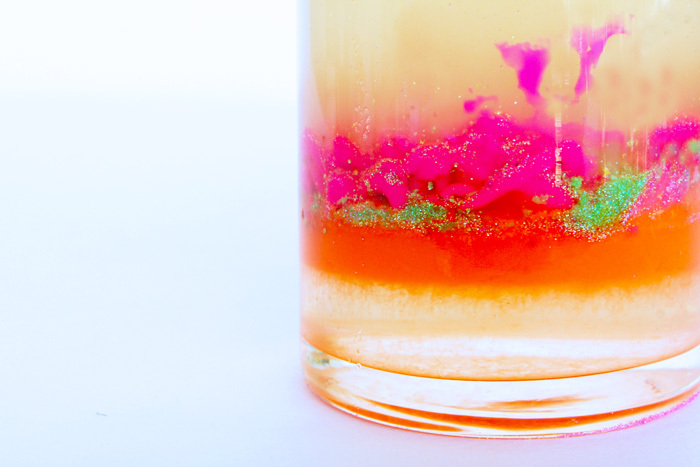 Make Glow Water: Break open a highligter and remove the ink cartridge. Soak the ink cartridge in a glass of water for several hours. For the most dramatic effect I recommend making your tower in the dark using the black light. Have all ingredients laid out beforehand nearby. 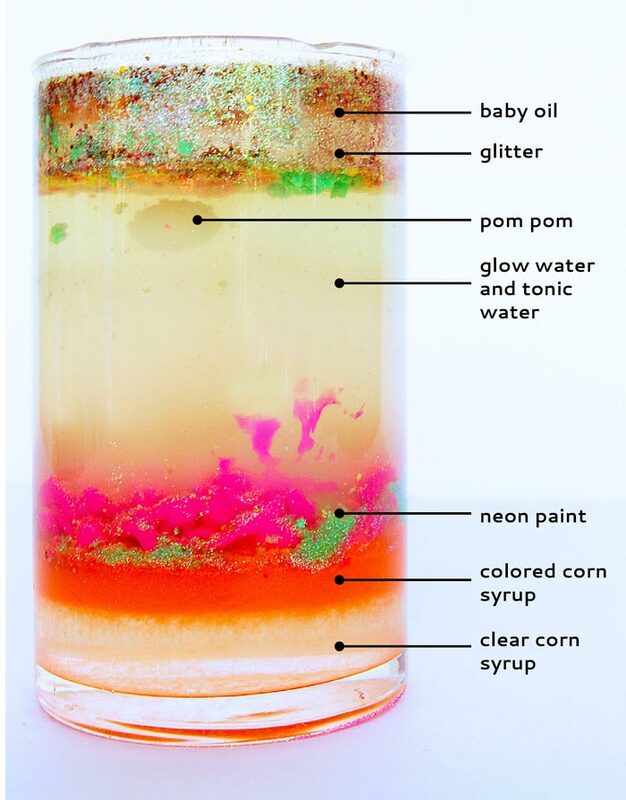 Step One Pour a layer of corn syrup into the bottom of your glass. Step Three After each layer is added let the liquids settle. Step Four Adding glitter to the top of the tower and watch as it slowly coagulates and drops down the layers of the tower. Do the same with additional squeezes of neon paint. 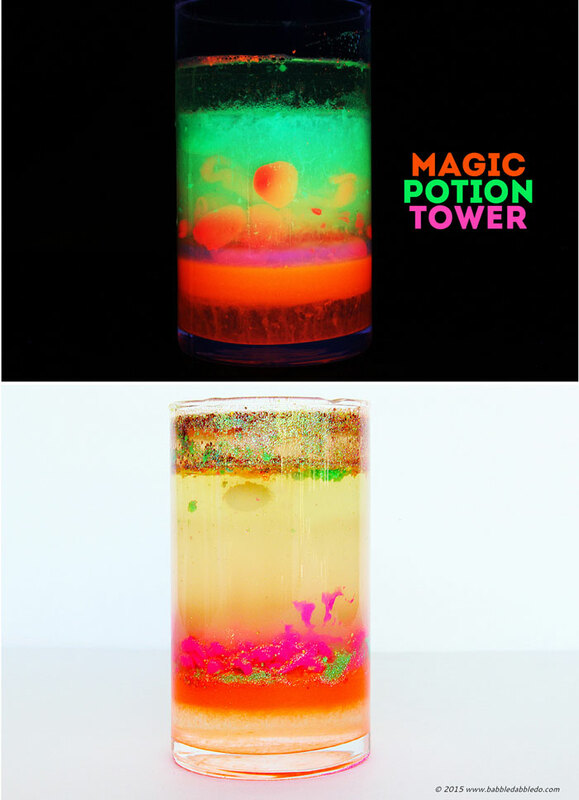 Add drops of glow water to the top of the tower using droppers and watch them float through the layers and disappear. Tilt the glass when adding in each liquid layer. Gently pour the new liquid along the side of the glass when adding it. It will help the liquids stay as separate as possible. 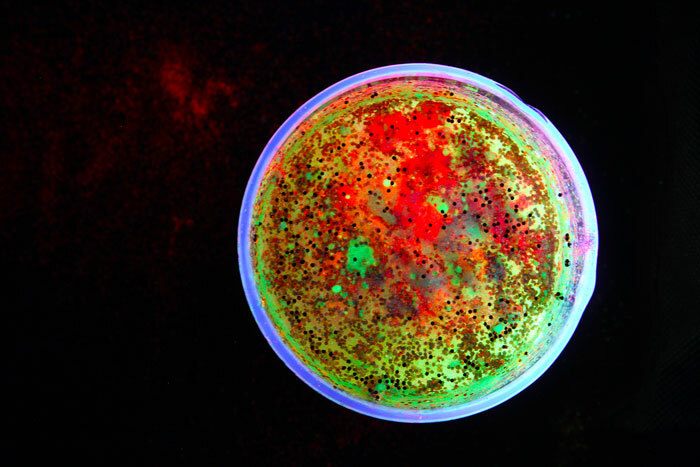 Tonic water naturally glows because it contains chemical called quinine, which fluoresces. Make sure your tonic water contains quinine. Let it settle. Letting the tower sit over the course of a few minutes or even a day will allow the layers to really settle and separate. 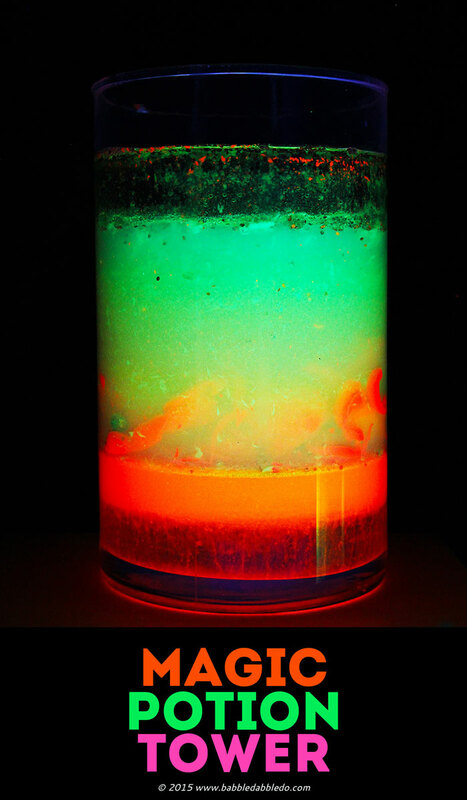 Our glowing density tower is a fun way to demonstrate two scientific concepts: density and UV light. Density is the measure of how heavy the particles that make up a substance are and how close the particles are together. For example, water and oil have different densities: water molecules are very densely packed while oil has more loosely packed molecules making water heavier than oil. When you combine liquids of different densities they naturally separate with some liquids sinking and others floating. UV Light Our glowing tower also illustrates UV light. Black lights emit a type of light called long wave ultraviolet light; certain materials react to this UV light and fluorescence, or glow. Neon materials in particular glow brightly when exposed to UV light. Certain natural materials and chemicals also glow when exposed to UV light including corals, jellyfish, some arachnids, and minerals. Robert Williams Wood. Robert Williams Wood was a physicist and inventor credited as “father of both infrared and ultraviolet photography.” He developed Wood’s glass in 1903 which blocked out most visible light but allowed UV light to pass through it. This type of glass was used to make black lights until other materials replaced it in recent years. Wood suggested that it be used for secret communication among other things. He also developed the Wood’s Lamp, which is used in dermatology to detect certain skin conditions, which fluoresce under ultra violet light. Among other interesting parts of his career Wood also photographed sound waves by using sparks and their reflections. You can SEE sound waves here. 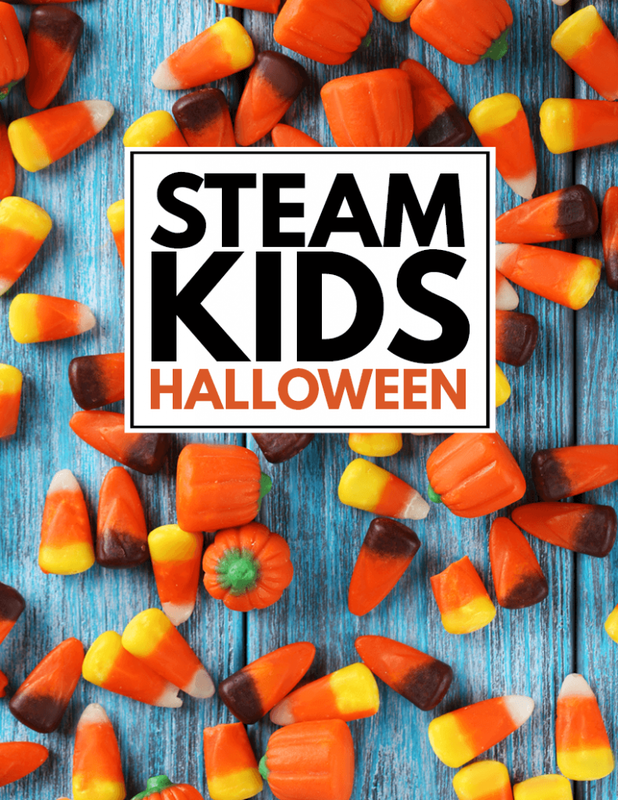 We’ve got lots more STEAM Halloween projects to try in our STEAM KIDS HALLOWEEN eBook. Fun and gooey! Gotta break out the black light. Seriously cool idea Ana! I had no idea that the ink in highlighters would fluoresce! We’ll definitely have to check out the black light. Fun! Seriously cool idea Ana! I had no idea that simple highlighters could fluoresce! We’ll have to check out the price of black lights. Fun! Amazing. This is a breathtaking experiment. I can’t wait to try one with my son. Oh, my! I’m sure my son will SERIOUSLY love this idea! 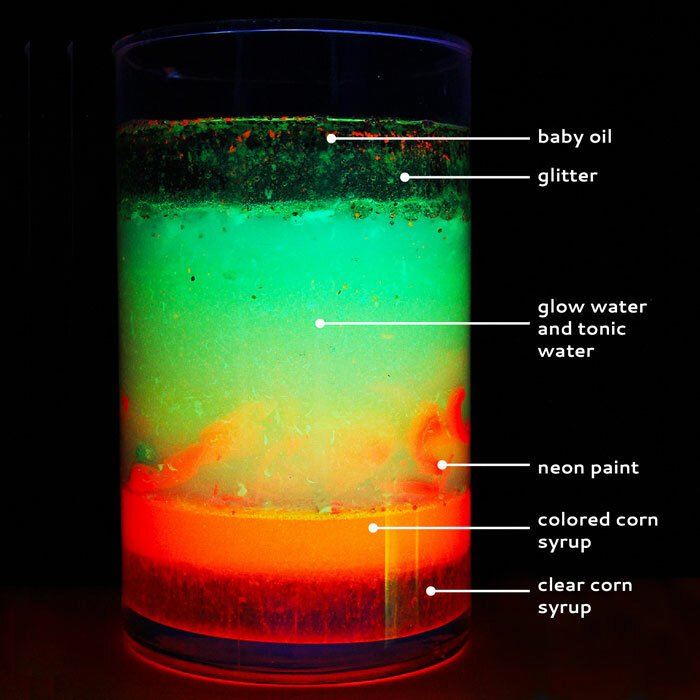 Why is the glow syrup (Fluorescent paint and corn syrup) lighter than the regular corn syrup? I figured it would be heavier because there is another viscous mixed in. Also, this is a great activity. I’ve told my friends to have their kids try it out. Good question! I am not sure why that is Lily! Buddy! really loved it. Excellent process to make light in water. I want to make it. Specially thanks for video, it will help us. I think it is not a tough technique. Those look like so much fun to try. I’ll have to show the kids them and let them pick out a project or two to try. how long does it last for (glowing in the dark)?